This is how we are feeling at our house tonight. We were ready to watch the beating........but look at Harper's face - that is how we felt during the game. WHAT? We are winning at halftime? We had a great chance to win the game but just gave it away. (or maybe I should say the refs helped us give it away). I would TRULY rather be just killed in a ball game by the #1 team in the country then come so close to winning and completely blow so many chances and to lose by a field goal. It hurts. But we still love Tim Tebow and we hope the gators or Alabama go all the way and the SEC wins ANOTHER National Championship! Tim Tebow had Psalm 25:1 under his eyes today - look it up - it's a good verse! I told Harper during the game that I was praying she would marry a boy like TT. Only not a gator fan. ha! (I do pray for her husband every night. I pray his mom is rocking him and singing praise songs over him and praying for his wife). Today was the first day Harper watched an entire game with us and she was SO good. I think she was a little scared of all the yelling her parents were doing though. I know a lot of Gator fans read this - great game! PLEASE win out now! In other news - yesterday was Laurie and Steve's 5th anniversary so we kept the girls so they could have a date night. Harper had a great time having her friends over to play. (Look how she is holding Sarah Kate's hand). Laurie's girls are so beautiful. I just love them. We had a great time. But I SERIOUSLY don't know how all of you with more than two kids do it. Bless all of you! ha! P.S. Does anyone know where we can find a good kicker??? It was such a good game! We were cheering on our Hogs all the way in California! BTW, I love Harper's outfit today!! Wow, that sounds like a really cool game! 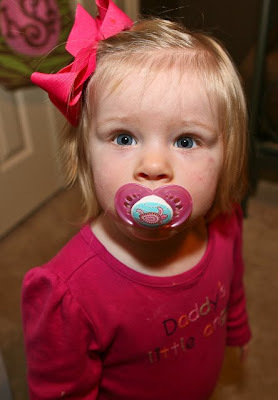 I love Harper's accessories! 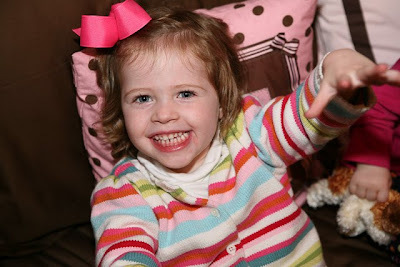 I love the prayer you pray nightly for Harper. It has encouraged me to do the same for my boys. I love your blog. Sorry about the loss! I was watching the game with my husband. 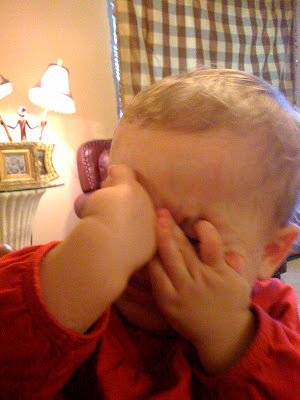 I told him that I'm a big Tim Tebow fan, but my favorite blogger is an Arkansas fan! I love Harper's clothes. She's precious! I'm in Louisiana visiting my dad and the game wasn't on here :( BUT now after reading about it and watching parts of it, I'm glad I didn't watch it - I don't need that high blood pressure while I'm pregnant ha!! At least I get to watch South Carolina/Alabama now. Yes, I do actually know where a great kicker is....on the sidelines at the Razorback games in a cheerleader uniform. Seriously!!! Kelly I've followed your blog for many, many months and never cheered for Arkansas BUT today I was pulling for them to beat Florida so badly!! I'm an Alabama alum and I wanted them to lose but it wasn't to be. Your Hogs sure looked good though! They could have pulled it off if they hadn't left so many points on the field. The SEC rocks!!! Not another conference in the country with such excellent teams. ROLL TIDE, ROLL!! I was so hoping for an Arkansas win today!! And yes I'm looking forward to church tomorrow too! Have a great evening! I was SO hoping the hogs would win. I'm a UGA fan and we do.not.like.gators! Also, I agree that mamas should always be praying for their children's future spouses. Can I just tell you that prayer works? God is good and has brought someone wonderful to each of my children. Gotta love a man who supports my blog addiction! You take such wonderful pictures, do you scrapbook at all? Well...needing a new kicker and a few new referee's we are home feeling the same way. We are proud that they played so well but it was just too close to lose. I had to make a run to Hobby Lobby and must have called Marc 10 times asking for the score. They were doing so well I was almost sorry I wasnt home watching the whole game...then who knows what happened! Having three kids is lot of work but God just gives you the grace to get through...hehe! Looking forward to church in the morning too! I just might be able to wear a sweater...yeehaw! I know is was a sad game! We were really cheering for those hogs! Although, my husband was cheering because if Arkansas won it would make our (A&M) loss not look so bad...or something like that??? I think Harper should wear her victory dress anyway...it was better than expected! We were so close to taking down Florida! SIGH!! Harper is a doll....as usual! It was such a a great game!! We were rootin' for the Razorbacks....to help move our Longhorns cloer to #1!! I adore Tim Tebow too....what a great young man! The TOP 3 Quarterbacks in College Football (Tebow, Colt McCoy and Sam Bradford) are all Christians and give all the glory to God! So proud of them all! I was pulling for the Hogs all the way today and agree that the refs did a terrible injustice for y'all! So frustrating. Seeing that you pray for Harper's husband is one of the sweetest things I've ever heard! I actually thought of your blog when I saw the score on ESPN a few moments ago... and came to check out what you had to say! BTW, Harper was wearing the SAME OUTFIT my daughter wore today. Guess great minds (or MOMS) think alike! No need to freeze time for Timmy Tebow! I'd be happy to marry him right now :) I actually went to UF for 2 years. One night, I was giving my friend a tour of campus. As we were driving by the stadium, we looked to our right and there was Timmy (with no shirt on). We were a bit thrilled, to say the least!!! We were yelling "SOOOOOOIIIIIIEEE PIG" all the way in Big Orange Country today Kelly!!! Great game today! The Vols were off this week so we practiced our best hog call all day!! We're back in action next week to play the Tide. GO VOLS! I was thinking about you while I watched the game today. What a nail-biter! Florida already beat my team (TN) so now I hope they keep going and win the National Championship for The SEC again! We just watched the game and were pulling for you guys! I don't like it when FL wins. Harper always has the cutest clothes, I want her wardrobe but for my baby boy! This Tennessee Vol was cheering for Arkansas with everything I had today! My uncle is an Arkansas alumni and I'm pretty sure he has now buried himself under the covers and refusing to come out again until Monday morning when work calls. 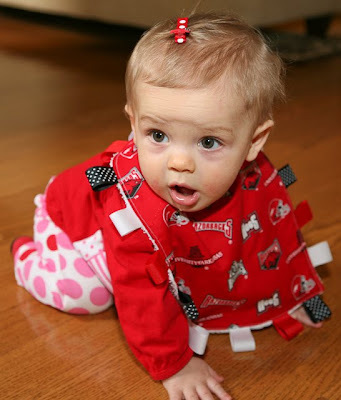 Harper looks adorable in her Arkansas bib and polka dots! At least you aren't a Vandy fan! I love the Commodores but our offense is just terrible! Harper is adorable! All Arkansas fans should be very proud of their team...they played a great game! I know that hurt to lose that game! I was SO pulling for you Hogs! It was close...I got to go watch the Tide Roll now! P.S. Could Harper be any cuter sporting her Arkansas bib??? Love it! We are Gators through and through, and we are so happy they pulled out a win. Y'all played AWESOME however. We were so impressed! Love Timmy Tebow and the whole Tebow Family. They are such sweet folks who love Jesus. Harper is adorable! I love your Blog. I am holding baby #12 as I type and it thrills me to see how much you love being a Mama. It truly is something I thank God for every day. So sorry for the loss! I didn't watch but heard the refs literally gave the game to FL. I'm looking forward to wearing my Purdue shirt to church tomorrow after we beat Ohio State. Plus, USC beat Notre Dame so it is a good day in this Boilermaker household. Your daughter is adorable. She is always dressed so cute! 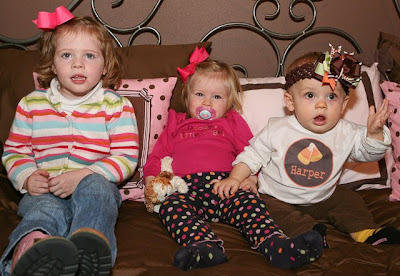 But on another front, Harper and her BFFs sure are cute together. Laurie's girls are so cute. Emily has that glint in her eye that says she is full of personality. What a cutie. I know Harper enjoys being with them and learning to play. What a sweet thing to pray for her husband. I know your pain but at least it wasn't a beat down. That is what we kept saying about our loss. I hope the Gators win the whole division now! Have a blessed Sunday and Harper is a cutie in her Hogs attire!! OHH girl, I thought I was going to have a nervous breakdown during the game today. I am so proud of our boys!!! Now we just need to beat Ole Miss and LSU, well all the games but I really want to beat Ole Miss and LSU!! Great pictures of Harper, love the outfit!!! Have a great rest of the week. My favorite teams are Georgia and whoever is playing Florida, so I was cheering along with you (while sitting on my couch in Florida beside my Florida fan of a husband). I totally agree...that was an AWFUL call!! What a heart breaker! Hi Kelly - I don't usually comment, but I am giggling because my little girl, Parker, was just wearing the exact same outfit, with the apples on it, the other day... Trumpette socks and all! :) God bless you and your family! Love Harper's outfits for the games. She's so cute in red. I was so nervous during the game, I didn't think it would be a big deal but the Hogs played hard and y'all did great! I am happy Gators won, my dad just about had a heart attack my Mom said. I too hate to lose for bad calls or a field goal. Those three girls are going to have so much fun when they are a little older. You guys put up one heck of a fight today. I thought about you and Harper the ENTIRE time I was watching it. I even mentioned to my friend (who is also one of your followers JAG) that we had to win 'cause I could see your post now about the HOGS! The game today proved that the SEC rocks and is the BEST! Great game! We're sad in Springdale, too :( I sure hope we can bring this team to Oxford next week for our old friend, HDN! Go Hogs! I'm sure you get these all the time, but you got a blog award!! If you wanna see, check my newest post!! Love the blog and so sad the Hogs lost!! I was routing for the HOGS today!! Y'all so deserved to win!!! UGH... but great game! The picture of you and Harper is beautiful. You are so right about praying for Harper's husband. I should be praying for my 18 mo. old son's wife. Sorry you lost today! I actually do know where there is a great kicker...on our team! TEXAS TECH! We actually won today against Nebraska. Hopefully now we'll be ranked in BCS! Harper is getting so big! I see a lot of Florida haters on here (No one likes you when you are on top) so I have to put my 2 cents in. I love the Gators and love Tim Tebow! BUT, I will give credit where credit is due and that is the Hogs played a great game (or equally as bad as the Gators!?!?) Our Pastor is a huge Razorback fan so he must have been praying extra hard this game. Way to close for comfort for this Gator! :) God bless you and your family Kelly! Hmmm, I sing hymns to my little man every night. And I've certainly prayed for his future wife. I'm sure he'd love a cutie pie like Harper! I think I mentioned to you last week, wait and watch! The way Arkansas played Auburn I felt very good about the Hogs chances today. They played a GREAT team a GREAT game! Love the pictures, thanks so much for sharing. I love the expressions on Harper's face along with your captions about the game. Sooo cute!!! Don't worry. I'm definitely praying over him and singing praise songs and praying for his wife. :) I did a radio show in-studio today and Boo Mama was a call-in guest. I thought of you. :) Wish you could have been there. I was down in the Swamp tonight and it was not pretty! I was scared that yall were going to beat us tonight. It was one game that was very stressful! But go Gators! I know where you can get a good kicker in Jax, FL and he plays for Trinity Christian! GREAT GREAT GREAT kicker... BUT I do hope he goes to Florida! Can you believe it???? We are SO upset!!! The Refs defintely had it out for us. We better win next week!!! I agree with the praying for your children's spouse thing...I do the same for Annabelle! And would love for her to marry a guy like Tim Tebow. I have always wondered what it's like to be his momma... WOW..I cant even imagine how proud she must be of him! I was really impressed with Arkansas today! Although the Gators looked pretty bad!! Bama isn't looking much better at the moment against S. Carolina! I would LOVE to see Bama and Florida in the SEC tourney again this year....only with a different outcome!! That's why "alone time" training is so critical in my home! :) Love the expressions you captured of Harper! I'm just sick over our loss!! We were so close. Sorry for the loss. Hope it will be Bama playing in the SEC in just a few weeks! Roll Tide! We were at a wedding all day today and when we got out to the car the first thing I heard was how close the game was and I thought, Shoot, I bet Kelly is devastated! LOL--so I wasn't surprised to see the post! Cute taggies bib & toy. You have very talented friends. Can I tell you--I am Catholic, so I don't sing too many praise songs--just not part of our tradition--but while holding and rocking both my boys, I pray that somewhere, some families are growing each of them a beautiful life partner, someone who will love them as much as I do, and adore my boys like I adore my husband, and I pray that I raise them to be good and thoughtful husbands, fathers, and sons. I am so glad that I am not the only one out there praying for families I may or may not know. I thought I was the only crazy one out there in a glider with a baby I can barely envision in school, let alone grown up and married, and praying already for the ones that God will lead them to. Thanks for letting me know I'm not alone in that! Have a great rest of the weekend if you can get over the game! My hubby and I were pulling for the hogs for you today! We are big Penn State fans so we were like fliping channels throughout the games! I thought the refs did a total injustice on ya'lls part! Harper's little taggies toy and bib are just precious! I loved your post tonight! You are soooo funny! We are big Gator fans in our house. We live in Utah and followed Urban there when he left. I showed my husband your pics of Harper last week when she was "scared" they were playing Florida. When we tuned in at halftime the first thing he said was "that blog you read will be happy". He told me at the end of the game that I could admit that the refs gave that game away. However....there were a few missed points that didn't hurt Florida either! Oh Harper (and Kelly), I'm feeling the way you are in that first picture, too--only about Wisconsin's loss. Such heartbreak!!!! We are in mourning over here! Harper looks like a big girl today! Sitting up tall and all. She is growing up right before our eyes. Thanks for sharing your pictures and words! I'm with you on the kicker, Kelly! Tejada needs to go or get his behind in gear and learn to kick. Of course the refs bad call didn't help either. I am very proud of our Hogs tonight though! Disappointed in the loss but proud of how the played. great pictures!! such a cute post. great team spirit and gracious in defeat. TT is a good guy to cheer for even though it was against your team! Hope you have a great weekend! ok now, how about some LSU love??? LSU can take us all the way to the National Championship! :) well, maybe not this year, but there is hope :) I am a huge Tiger fan!! And yes, we are looking forward to church in the morning, Drew (my 19 month old) is wearing his new navy corduroy pants with a his new navy/light blue plaid shirt :) I dont know what Avery (my 5 month old) will be wearing yet, i better go pick it out :) have a blessed sunday! I totally agree - I'd rather get slaughtered (by a really good team) than loose any kind of heart breaker at the end! Of course, I'd rather just win them all. oh that game was so heartwrenching! we were cheering so hard for the hogs! i thought they were going to pull it out :(. (and i agree that one of florida's touchdowns was totally because of the refs' terrible calls--twice!) hope yall had a great weekend! I love the pic of the two of you. And I love the pic of the three girls. Back when we only had Dylan, I use to always say, after keeping my family/friend's kids, that I didn't know if I could handle more than one at all time. haha! I have to say it is SOOO much easier when it is YOUR two babies. We can't wait for church tomorrow either. I'm teaching Sunday School for the first time! Kelly, I , like the rest of the free world, have been reading your blog for many months now but have never posted a comment. (too shy) But I had to tell you how incredibly sweet it is that you pray for Harpers husband!! I never thought to do that. What a wonderful thing to do. God bless you and your family. We do wish AR had won, but any team but Texas is the championship is ok with me. Would prefer an SEC team. Our daughter will also wear a victory outfit tomorrow sorry stole the idea from you. Do you know of any Razorback clubs in South Texas? I feel your pain, I was at the game last week pulling for LSU! I really thought your hogs were going to pull out a win. The Florida staff should send the refs flowers or something (or give them a bonus since they're probably paying them already)! Thank you for mentioning that you pray for Harper's future husband. It inspired me to pray for my son's future wife. Such an important thing to do! There's nothing like a praying parent! You crack me up! This post is so cute. Kelly, I've never thought about praying for future spouses for my children, but you inspired me!!! How awesome is that!!!!!! 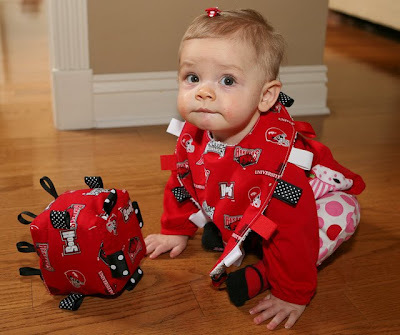 Thank you for posting a picture of sweet Harper in her Hogs attire! She is a doll!!!!! It is seriously a miracle that I have any fingernails left after that game today! Our boys were doing SOOOO good and then all of a sudden the Gators decided they'd like to play a little ball too. What is up with that? At least we didn't let them run away with it and they sure gave 'em a run for their money!! Love the bib and I LOVE that picture of you guys together...too cute!! The only thing that Florida has over Alabama in our book is Tim Tebow--he is one stand up guy. And of course...as always, Harper is just TOO stinking cute! Thought about you during the game. As an SEC fan I was cheering for Arkansas. Man, what a great game! My dad is a crazy Florida fan and I told my husband that I was so glad I wasn't at his house watching the game! I am sure it was high stress over there! Hi Kelly. I was holding my breath when the kicker came out with a tie ballgame. So sorry he missed! If he had been a little more centered, I believe he would have made it! I know the agony of defeat all too well lately, I am a UGA fan! :o Have a great Sunday! I was watching that game too. Holding my breath that the HOGS would defeat those gators. Although I do think Tim T. is precious... I wanted so bad for the HOGS to have that victory. Funny thing... I never even thought about Arkansa until I started reading your blog. Now you've probably got half the country to (well of mommies anyway) pulling for your team. I think the University should give you some kind of royalties for that, don't you. Thanks for pulling for BAMA to go to the National Championship! We appreciate your support... and HOPING this is OUR YEAR!!! Hope you have a great sunday service!!!! I'm a HUGE Gator fan, and a regular reader of your blog. During my nightly blog skimming I actually avoided yours because I was still decompressing from the stress of that game, hahaha. Good for you all though! I'll take our win, be it from the refs or not...now I just hope we win out!! We bleed orange and blue here, and that game was SCARY! lol. We were also screaming and yelling at the tv the entire game. It was not pretty. But Harper sure was a cutie! Even though I'm a die hard Vol fan, I was totally rooting for the Hogs last night on your behalf!! It doesn't hurt that we really can't stand the Gators!! So fun that the SEC is so amazing! We were pulling for Arkansas yesterday (we are LSU fans). I have to say- I couldn't believe what I saw yesterday! They were incredible. We so hoped they'd pull #1 out from underneath the gators but it wasn't to be. I agree- terrible to lose by a field goal! BUT- I will say- y'all gave them a run for their money! BTW- my little Lilli had on Harpers little outfit Friday. It was a little big- I bought a 9 month. But I LOVED it...she kept trying to grab the polka dots of her leggings! So sad. :( We really were rooting for you. Doesn't it hurt to come that close and lose? I watched your game today because I LOVE TT...I knew his sis in seminary and then her baby was in my baby room @ church before they went to be missionaries to Brazil. Neat family. I think you Hogs can hold your heads up proudly--you played a hard, good game. Wish I could say that about my (OH St) Buckeyes that embarrassed us horribly today!!! Hope Harper did well today in the nursery! I was pulling for the Hogs! Glad Florida won, though...now we don't have to hear the annoying Bama fans go on about being #1. Trust me, if you're not a Bama fan in Alabama you would hate them. Harper looks adorable as always! I don't comment very often but I just have to say that I was cheering for ya'll yesterday even though I am an Auburn fan! I lived in Gator Country for 10 years as an Auburn fan so I would rather cheer for Alabama than Florida! Awful I know! The loss was such a let down, but I am glad that our Razorbacks played a close game!! Harper definitely should wear her victory dress... it really was a victory considering what everyone expected the score to be! I hear they are having open try outs for a kicker next week, ha! Hi Kelly - I added a link to your "do you make" entry... Sorry that I am late! Oh Kelly! I don't think I've left you a comment since shortly after Harper's birth, although I've followed you faithfully since then. But, I HAD to leave you one on this post because I am a big Gator fan from Florida and I was AT the game yesterday. Arkansas played a great game and I cannot believe FL won, but of course I was thrilled. My seats were near the small Arkansas fan section and the band/cheerleaders and I totally thought of you when they were all calling the Hogs! Harper is so precious! Hope you all have a great Sunday! Oh, and I know what you mean about TT - he's an awesome player and man of God and I am praying that my two daughters will find a man like him someday and that my son may grow to be a like him, too! This Texas Tech household was pulling for your Razorbacks yesterday. So sorry that they lost such a good game. Tech found one of it's best kickers in the student body section during a contest last year! It was such a close game too! Kelly, I like you, but you're wrong about the calls. I was in the front row of the game yesterday and Ark pulled about three facemasks on FL that were not callled. So actually, y'all were lucky there. That said, the Hogs played a great game, but pig sure tasted good for dinner last night! Go Gators! That game almost left me physically ill. I didn't believe we could win and then, to come so close, HEARTBREAKING! Oh well, as long as we beat Ole Miss all will be forgiven. Hi Kelly! First of all I love your blog! You have a beautiful family ! I just thought I would share something I came across today with you. As I was postig a giveaway today with McKLINKY I saw that they have a prayer request MCKLINKY you can post for others to enter in their prayer requests. Im not sure if you have already seen this, but I noticed that you have a prayer request website and I though this might come in handy for you. Hope this helps! God Bless!here is a link to see an example. First time commenter here, but definitely had to chime in for my awesome Gators (who did not play so awesome yesterday...) My husby and I thought for sure it would be another Ole Miss repeat. Anyhow, I did think of you while watching the game too! First off...how about those HORNS??? Ok...sorry about your hogs. My baby is 2 now and doesn't always want to be rocked to sleep, but I have rocked him and sang praise songs to him every night since he was born. It's the sweetest, most precious time of the day! It's so good to know that other Mommas are doing the same thing. I love that you are already praying for Harper's future husband. I, too, pray for my sons' wives. When I married my husband and his mom shared that she'd been praying for me since before I was born, I was floored. I don't know of very many statements that have ever left me speechless like that. I was not raised in an openly praying home and it just meant the WORLD to me. Please share the fact that you've been praying for him with your future son-in-law someday! I got chills about the praying for Harper's future husband. That's incredible. I'm a firm believer in praying praying praying well in advance! That's a blessing! I thought of you while we were watching the game. It was an ugly win for us, for sure. But a win nontheless, thank goodness! I agree, it's going to be Florida and Alabama in the SEC game. I thought you said UGA was your #2 SEC team! We play UF in two week. So no winning out for them! I was telling my husband (a BIG UF hater) that if you won on Saturday, we were in real trouble. But, we are always happy to see UF loose. That's what happens when you have a UGA grad and an FSU grad in the same house! I was especially impressed ya'll played so well in the Swamp. I completely agree that you were robbed by the refs! Sorry about a tough loss! I went to church with Tim Tebow when we lived in Jacksonville. He has a great testimony and his using his position to glorify God. On a side note, he played Goliath at our kids musical a few summers back! Too Funny! Kelly- I just thought you should know that the SEC reviewed the call and in fact the penalty should have never been called! I was thinking about you as I was watching the game. I definitely think the refs helped out Florida a bit. No way they should have had that last TD. Oh, well. What can ya do?!? Great effort by your team, though. P.S. 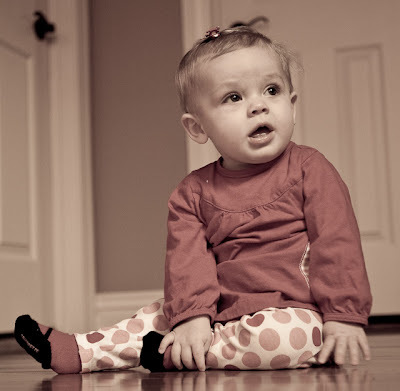 I bought that little apple and polka dot outfit for my Lily Ann ~ who is due in February. I just love it!! !